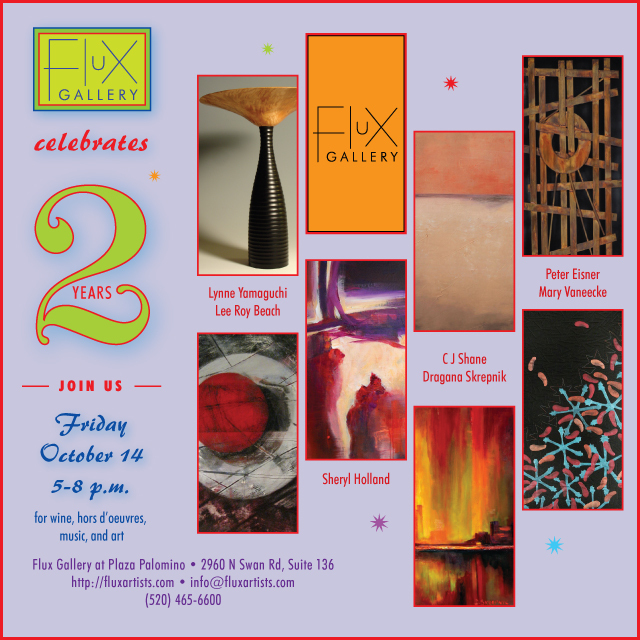 Flux Gallery will celebrate its second year of operation on Friday, October 14, from 5 to 8 p.m. 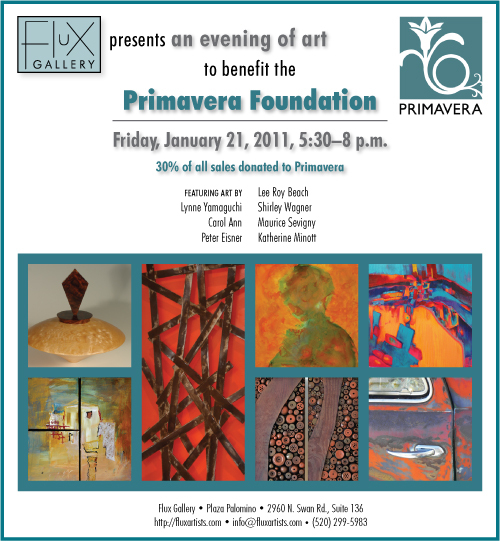 Please join us for wine, hors d’oeuvres, and brilliant new work by the Flux artists (including me, of course). 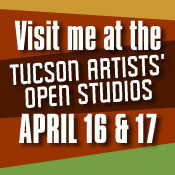 Flux Gallery is located at Plaza Palomino, at the southeast corner of Swan and Fort Lowell Roads in Tucson. 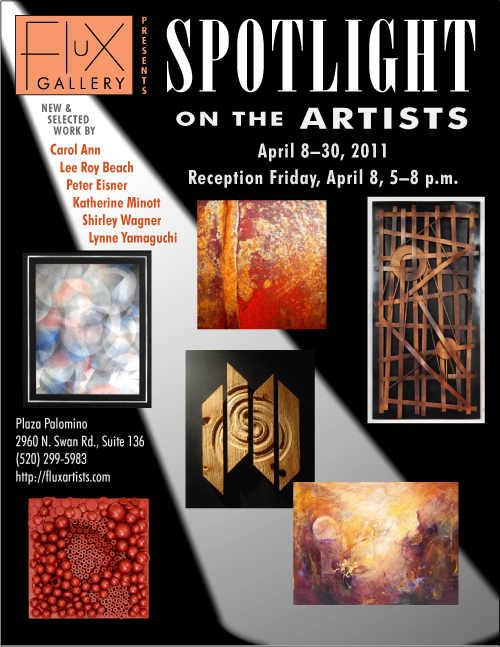 Next month, Flux Gallery will be rehung to create a “Spotlight on the Artists,” with a reception Friday, April 8, from 5 to 8 p.m. Come by between April 8 and 30, Monday through Saturday, 11 a.m. to 4 p.m., to see new and selected work by Carol Ann, Lee Roy Beach, Peter Eisner, Katherine Minott, Shirley Wagner, and me. This will be one of only two events I will be participating in this spring, so I hope to see you there! For those of you on the East Coast (specifically North Carolina), later this month several pieces of my work will be part of an exhibition called Create: The Mysterious Art of Wood, “an exhibit about the patterns and figures, the colors and textures, and the form, proportion, and spirit that all converge in each wood creation to tell a unique story.” The exhibition will run from March 25 to April 20 at Cape Fear Studios in Fayetteville, North Carolina. 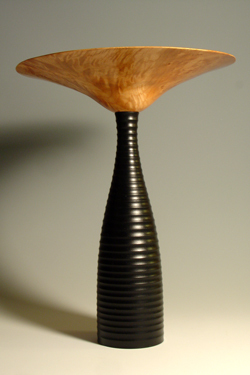 It will feature regional, national, and international artists, including Stuart Mortimer, Jacques Vesery, Ron Kent, Howard Schroeder, and me, of course, and will include turned objects, carved objects, boxes, furniture, even jewelry. If you’re in the area, please check it out. The opening reception will be held Thursday, March 25th, from 6 to 9 p.m.
UPDATE: Unfortunately, I won’t be able to participate in this show, because I have the flu. I hope you all will still check it out though! 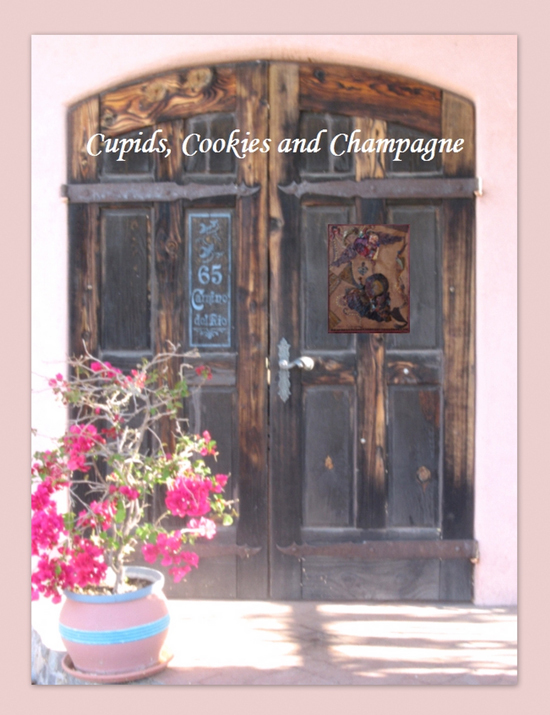 Come start the Valentine’s Day weekend with some gourmet cookies, champagne, and a private showing of art. There will also be a raffle with prizes including a one-hour design consultation, a Designlines accessory, and original artwork by Sara Spanjers, along with other contributions. Contact Patricia Mooney of Designlines Interior Design Studio, at 885-9577, or artist Sara Spanjers, at 731-1620, for further information. 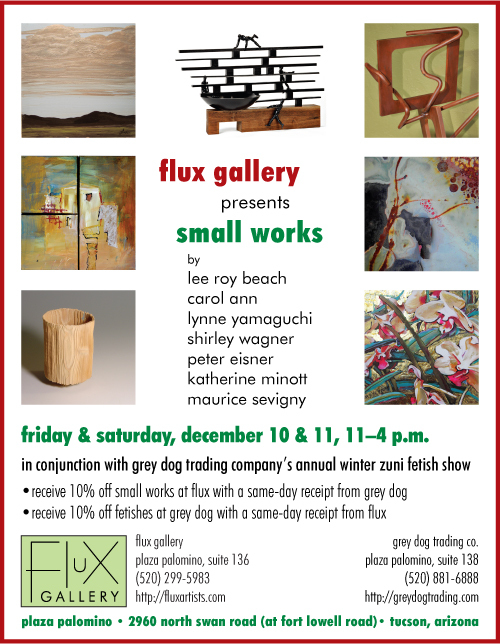 Flux Gallery will feature small works for sale on Friday and Saturday, December 10 and 11, 2010, from 11 a.m. to 4 p.m., in conjunction with Grey Dog Trading Company’s annual winter Zuni fetish show. (Grey Dog is just a few doors away from Flux at Plaza Palomino.) 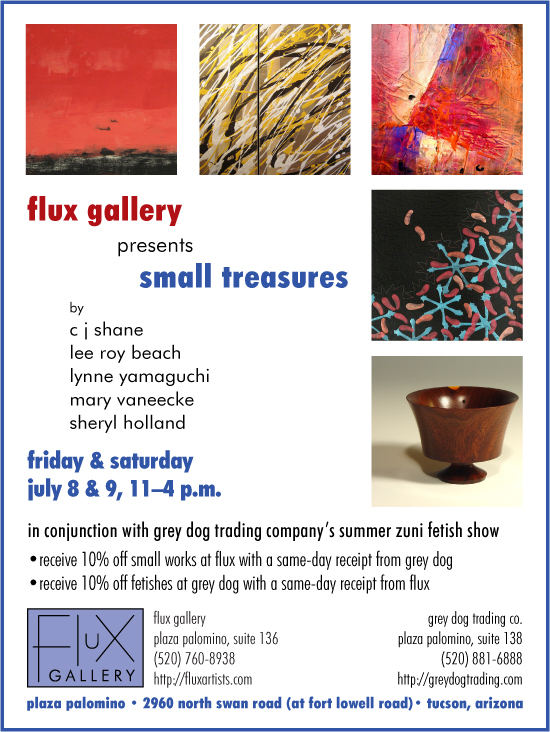 Customers who present a same-day receipt from Grey Dog will receive a 10% discount on the small works at Flux, or Flux customers can present a same-day receipt from Flux at Grey Dog to receive a 10% discount on their fetishes. In addition to the small works by member artists Carol Ann, Lee Roy Beach, Peter Eisner, Maurice Sevigny, Shirley Wagner, and me, we will also have work by incoming Flux member Katherine Minott, a photographer with a love of color and texture. Katherine won’t officially be joining Flux until January, but this show will give visitors a preview of what is to come. Join us next weekend at Plaza Palomino, and give your loved ones the gift of beauty this season. 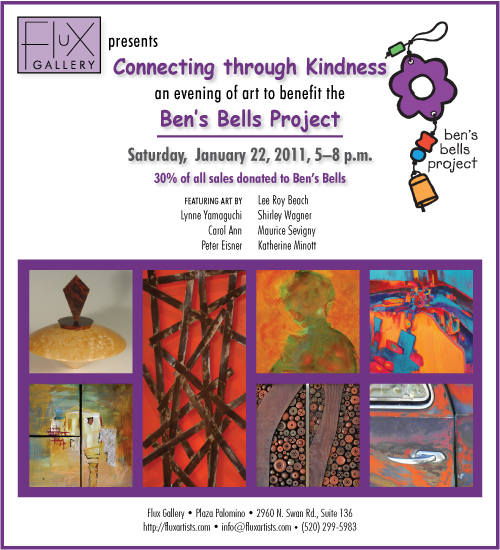 For further information, please contact Flux (520-299-5983) or Grey Dog (520-881-6888) directly.